Ramen noodles are good for more than just soup! 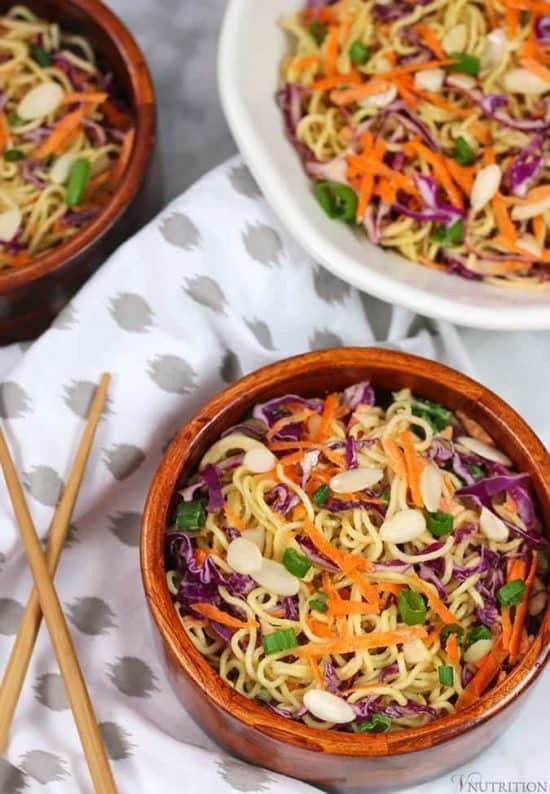 Switch things up and try them in this easy and colorful Vegan Ramen Noodle Salad! It’s perfect for BBQs, potlucks or even to brighten a regular meal. 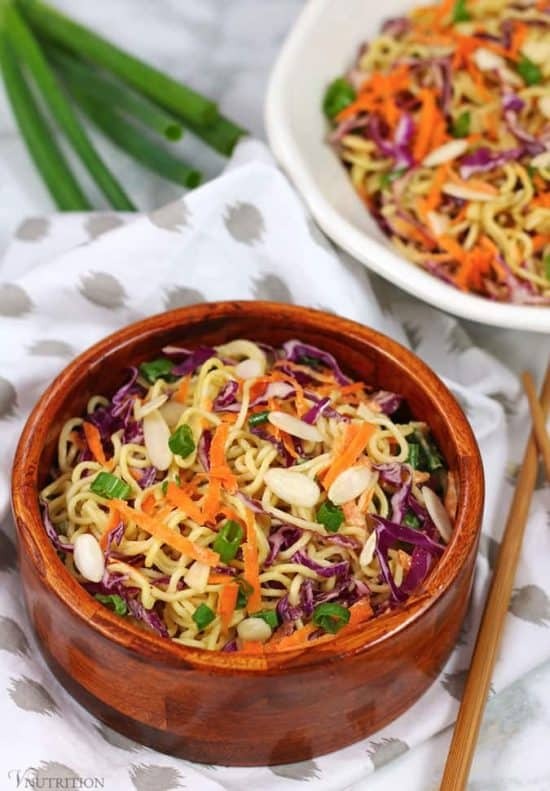 My friend Gina used to make a tasty ramen noodle salad for BBQs. I would get all excited knowing she’d be bringing it because it was normally the only thing I could eat. Back in the day, I was the only one eating veggie burgers (or anything veggie related) so if I didn’t bring something for myself, I wouldn’t be able to eat. Luckily most people don’t flinch anymore when they see a veggie burger and are happy to try my plant-based creations (my Ranch Pasta Salad and Easy Vegan Pasta Salad have been big hits lately). From what I remember of my friend’s recipe, it contained veggies, regular ramen noodles, dressing, and sugar. While the salad was really good, I kind of felt bad eating it because I knew it contained a lot of processed sugar as well as the fried ramen noodles. Since then, when the weather gets nice and BBQs come around, I think about that ramen noodle salad. It was a fun dish so I figured why not put my own spin on it using more veggies and healthier ramen noodles to make it something I could feel good about eating? While shredding veggies isn’t a long process I like to use my mandolin to shred cabbage. It only takes a few minutes with the mandolin (check out my tools for a plant-based kitchen post for more on that). Sometimes when I’m in a rush I purchase pre-shredded/grated vegetables for my Vegan Ramen Noodle Salad. It makes life even easier and if I have any left over, they’re perfect for other salads. If you know you’re going to be in a rush the day you make the salad, you can pre-shred the veggies and pre-make the dressing the day before so all you have to do the day of is cook the noodles (for a gluten-free option I use Lotus Foods brown rice ramen), throw everything into a bowl, and you’re done! I hope you enjoy my Vegan Ramen Noodle Salad. If you get a chance to try it out, please rate the recipe and leave me a comment below – I’d love to hear your thoughts. Share your pictures on Instagram too and tag @v.nutrition and #vnutrition so I won’t miss it! To show you how easy it is to make, I made a video for you! 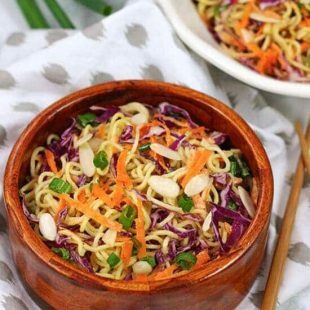 This colorful Vegan Ramen Noodle Salad is perfect for BBQs, potlucks or even to brighten a regular meal. It's so easy to make, healthy and a fun twist on lunch or dinner. Add all salad ingredients to a large bowl. In a separate bowl, whisk salad dressing ingredients. If the dressing is too thick for your liking, feel free to add a little more warm water until you get the consistency you desire. If you pre-cook the noodles, add a little olive oil to them before putting them in the fridge so they don't stick together. 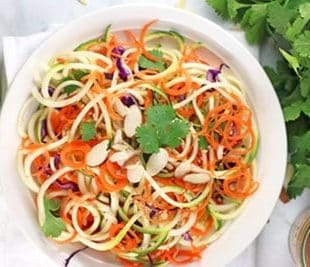 Like my Vegan Ramen Noodle Salad recipe? It would be so wonderful if you could give it some love by sharing! I love noodle salads. Totally underated. I betcha this would taste great with udon noodles as well. Loving this rainbow in a bowl, and great job on the video! Thanks Becky! That means a lot coming from you! I love this salad! The dressing is so delicious! I like to use gluten-free rice ramen. I also love the video! It shows just how easy it is to make this salad. 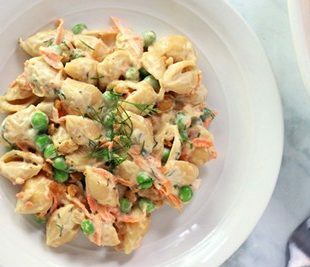 This would be perfect for summertime potlucks! Yes, that’s what I was thinking too Dianne! Love the colors and flavors, this is so perfect for a summer party. Thanks! This looks incredible!!! I love how easy it is and all the pretty colors in it! Tweeted for you! I love ramen but I never make it for myself at home, yours looks so colourful I should give it a try! Thanks! It’s so easy to make. If you give it a try let me know what you think! Oh my gosh, this looks so good! 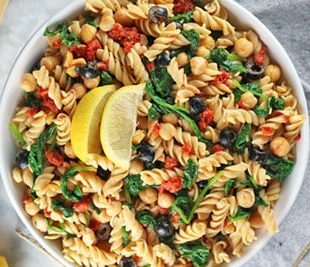 My family are pasta addicts, so this is a great spin! Thanks so much Sarah, we’re pasta addicts around here too! I pinned this immediately after you commented that this would be great to bring to a potluck so you have something to eat. Looks fantastic and I plan to make it this weekend. Thank you! This is so full of colour and flavour. Perfect for lunch or a light dinner. Thank you so much! Yes, it’s totally great for lunch or a quick dinner! What is the gluten-free option? I think I missed that somehow. Looks delicious! Hi Holli, the link for ramen noodles in the recipe part goes to gluten-free brown rice ramen noodles. They’re the Lotus Foods brand. I like them and a few of my gf friends have said they enjoy them too. 🙂 Maybe I should link to them somewhere in my post as well just to be sure people see that. Holy moly that’s a pretty salad. I have never had anything like this before. 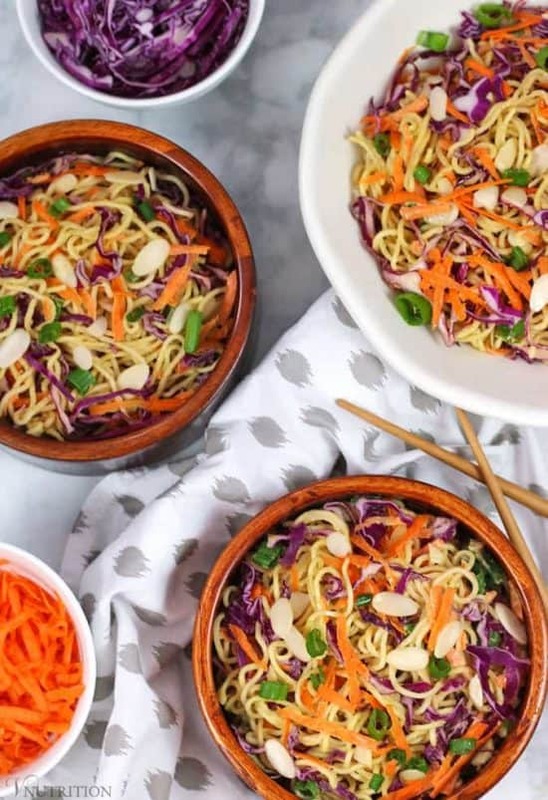 I’m usually not a fan of ramen-y things as I’m not a huge soup person, but this noodle salad sounds dee-licious. Looking forward to trying it out at a potluck! Great looking dish! 💕 I was wondering if agave could be used in place of the maple syrup? This salad was a huge hit a my BBQ! Thank you! I’m wondering, what is a serving size for this salad? One cup? I’m so glad everyone enjoyed it Alex! That makes me so happy! The full recipe makes about 5 servings so I’d say it would be about a cup per serving.